Zaha Hadid Architects is creating a portal to the FieraMilano: a 43-storey, 190 metre retail tower emerging from the site, giving shape to a torsion or vortex, a slow rising and twisting from its base. Horizontal energy is released into a vertical, spiralling vector aligned with the snaking forms of the housing across the river. 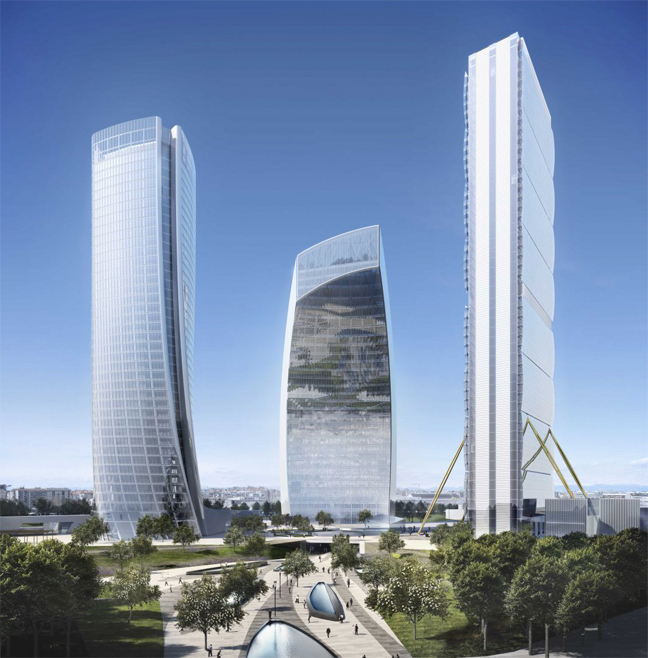 CityLife Milano rises in Milan, Italy and now it is under construction. At ground level, the double-height lobbies are flooded with light by large openings stretching from floor to ceiling, designed to confer strong visual continuity with the park. Although great consideration has been given to the ground floor design and morphology, the project is formally defined mainly by the roof profile and the intense urban horizon it generates. This strategy was determined by the awareness of forthcoming towers looking upon the residential roofs and by the strong will to engender, within the inner courtyard, a completely new residential landscape, reassuring yet dynamic. The Residential plot is composed by 7 linear buildings set along a continuous path around two land areas: Rc1, including buildings C1-C2-C3 and Rc2 with buildings C4-C5-C6-C7. The land areas are divided by a strip of public park. The buildings can accommodate up to 230 luxury apartments, with common facilities. 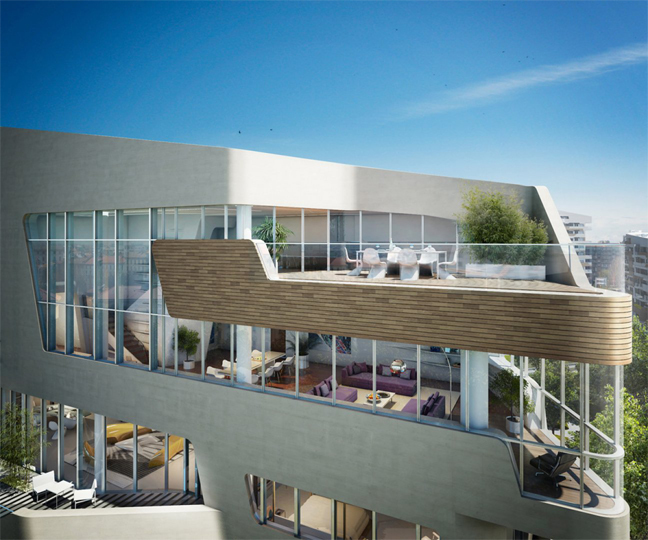 The skyline of the residential complex is defined and characterized by a sinuous fluid line. The roof outline raises continuously from building to building, starting from 5-storey C2 building facing Piazza Giulio Cesare it reaches its maximum height at building C6 13th floor, thus ideally setting a unified and unique skyline. Great care has been given to site and buildings orientation, taking into account environmental and comfort requirements so that most apartments face south-east and at the same time allocate the best views from the terraces, towards the city or the public park. The façades design involves continuity and fluidity: the volumetric envelope of the buildings is defined by a curvilinear movement of balconies and terraces, opening up into a rich variety of private spaces, both interior and exterior, echoing the landscape below. The façade materials – fiber concrete panels and natural wood anels – emphasize this complex volumetric movement and at the same time give a private and “domestic” quality to the interior of the residential courtyard. The high-rise as a building typology has historically been treated as a static, fixed strategy: a technocratic engineering solution governed by specific economic factors. For this project, in a radical departure from tradition, we investigated the urban location of the tower as a portal or gate to the FieraMilano. We explored how the passage from the site to this gate could give shape to a torsion or vortex, a sense of dynamic movement, to inspire our design approach. Moving from the ground datum of the Piazza Porta Fiera, the retail base of the tower slowly rises and twists, providing a pedestrian ramp with a bifurcation along its length, to service the galleria. This line of torsion continues to the tower, which releases its horizontal energy into a vertical, spiraling vector from the base to its crown, finally aligning with the snaking forms of the housing across the river. Congruent with this movement, the tower is structured as a stack of equivalent, economically efficient floor slabs that incrementally twist around a vertical axis. Developing the dynamism of the building, this twisting is algorithmically controlled, so that each floor has a different yet fractional, relational angle to the one above and below. All lateral forces are absorbed into a conventional, central core, while a radial display of columns support vertical load. The views and panoramas provided along the height of the office tower move dynamically, sweeping from the Piazza Firenze to the Piazza Giovanni Amendola. Viewed from a distance, the building’s exterior silhouette clearly demarcates an entry gate into a new, vital FieraMilano. The residential area has been designed with meandering lines across the park, with one of the buildings serving to transform it into a series of intimate, semi-public gardens for residents’ use.